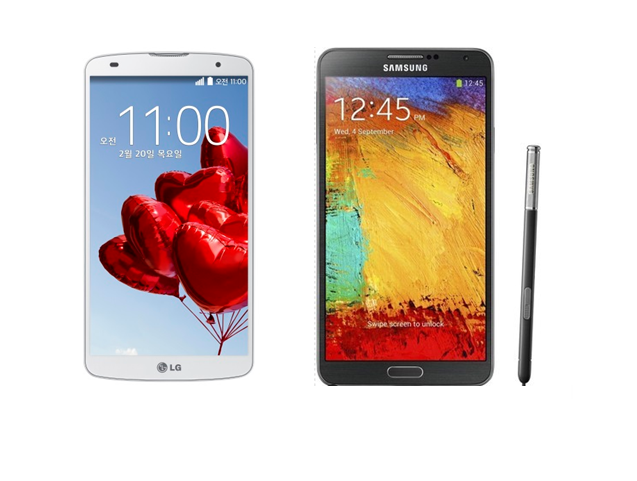 The Galaxy Note 3 has been the undisputed leader in the phablet arena. For users who are looking for a little more variety in the phablet marketplace, there is good news in the form of LG’s recent launch, the feature-rich G Pro 2. In this article we take a quick look at the comparative features or tech specs of the two devices. The LG G Pro 2 comes with the latest Android OS (Kitkat) and is powered by Qualcomm quad-core processor. It has a 5.9 inch full HD display with 1920×1080 resolution. Its highlights are the video and camera features such as the 4K ultra HD video capture, 20-photo burst mode, an 86000+ code combination capability for its Knock On screen unlocking feature, as well as others that include a dual browser, mini view, and content locking. The biggest drawback to the LG G Pro 2 is the lack of a stylus, which would have made navigating the big broad screen a lot easier. The Samsung Galaxy Note 3 on the other hand comes with Android Jelly Bean and is powered by Exynos 5420 Octa-core chipset (3G variant). It has a 5.7-inch full HD screen with 1920×1080 resolution. Unlike the G Pro 2, the Note 3 comes with a stylus and its prominent let down is probably the rather unclassy-looking look. The LG G Pro 2 will most likely become available in Asia and other countries worldwide starting March. Expect more details on pricing and availability in the Mobile World Congress which starts on Feb 24th 2014.